People who love dogs also love to spoil their canine companions. Do you baby your dog? Does it make you deliriously happy to shower your pup with gifts? Well, during this Christmas season, you may want to add these gift ideas to your wish list. Who knows? You just may find some of these items tucked beneath the tree. Do you worry about your pet escaping from the yard? After all, if your dog escapes from your property, he runs the risk of getting lost or hit by a car. So why not add electric fencing to your Christmas list? Electric fencing keeps your dog safe and close to home. The cost to install an electric fence is $962-$1434. If you and your dog have really been good this year, maybe someone will pay for the installation as your Christmas gift. So go ahead! Add it to your wish list. If you live in an area where it gets cold in the winter, you know that temperatures during this season can be brutal. So while you pile on the layers of clothing to keep yourself warm and toasty, don’t forget about your dog. He gets cold too! Ask Santa to give your pup some warm sweaters to keep him protected from the frigid air. Dog sweaters come in a variety of colors and styles. All of them are designed to keep your dog comfy and warm. He’ll also look impossibly adorable as he struts outside in his new sweater. Speaking of keeping your dog comfortable and warm, your pup will definitely appreciate a new dog bed. A bed will help your pet sleep better and can be especially beneficial for older or overweight animals. If you already have a dog bed, consider treating your dog to a clean bed by getting him a new sheet specially designed to fit pet beds. This sheet can be changed weekly to reduce hair, dander, and odors. Many of us do not even realize how dirty our pet’s bed gets. No one likes dirty sheets, including your pooch. Dogs love to play with toys that are soft and squeaky. So add dog toys to your Christmas list. Today’s dog toy options are practically endless. Chew toys, soft toys, noise-making toys, and balls are all perfect gifts for your dog. And you can’t go wrong with an interactive toy that requires your dog to do a bit of thinking to remove a treat or dollop of peanut butter from the toy. Toys that make dogs problem-solve keep them busy while you’re away so they won’t suffer from separation anxiety and chew up your favorite house slippers. Perfect for those walks around the neighborhood, dog strollers provide your pint-sized pup the chance to rest his little legs. Similar to a traditional baby carriage, dog strollers allow you to place your small dog inside it for a relaxing stroll. Made with stylish fabrics and modern designs, your precious pup will feel special and pampered as he rides inside it. Worried about your dog getting lost? Ask Santa for a GPS dog collar or pet tracker so you know where your dog is located at all times. These collars monitor your pup’s whereabouts so even if he escapes from the house, you can still track him down. Far from frivolous, these gifts can recover a lost dog and even save his life! You hate being separated from your canine companion, but you have to work. How else will you pay for his kibble and expensive dog toys? Fortunately, you can still monitor your dog in real time as you go about your work day. Just ask Santa to buy you a dog monitor. Dog monitors are cameras that let you spy on your dog all day long. They use the internet to function, so you and your dog can be separated by thousands of miles, but you can still see what he’s up to while you’re away. Admit it. You want your dog to enjoy the season by receiving gifts he’ll literally slobber over. As an important member of the family, he deserves to be showered with love and presents. 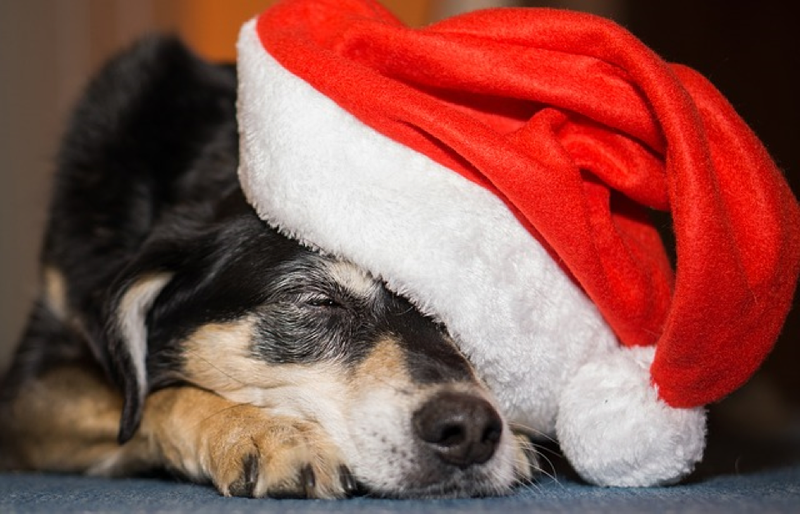 So if you want to make your pup’s Christmas merry and bright, add some dog-friendly gifts to your Christmas list. Your dog will thank you ! Thank you Cindy Aldridge for contributing this post!